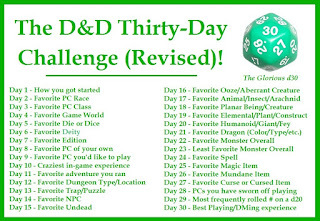 Creative Mountain Games: CMG Extra - "Favorite PC Race" Day 2 of The D&D Thirty-Day Challenge! 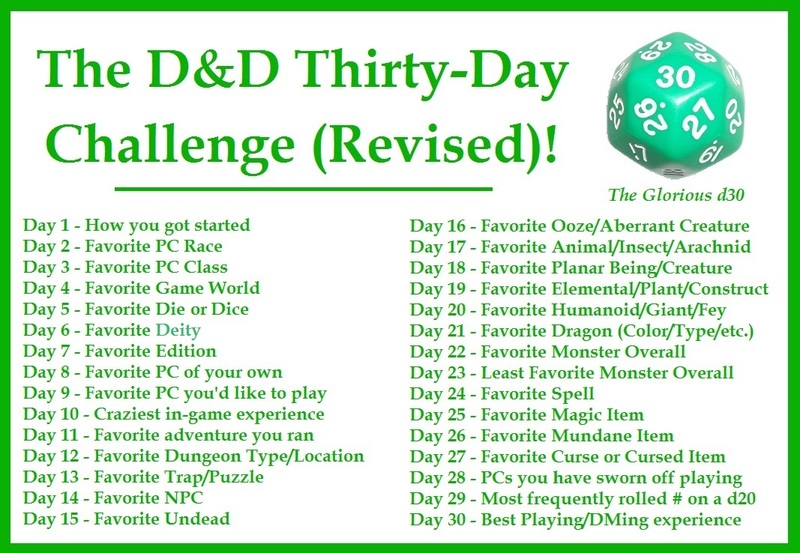 CMG Extra - "Favorite PC Race" Day 2 of The D&D Thirty-Day Challenge! I suppose I would have to say that I have had the most fun when playing Halflings. I should more properly say, "Hobbits," because when I play that race, I play them in that traditional Tolkienesque manner. I've played a few but one in particular springs to mind though it has been a couple of years since I had him at the table. 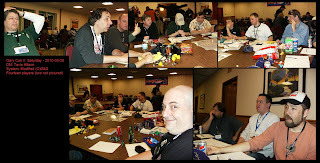 At the second Gary Con, a little over five years ago, Tavis Allison, perhaps best known for his work on the Adventurer Conqueror King System, got a bunch of us around the table to play his heavily-house-ruled version of Original Dungeons & Dragons [(O)D&D]. There were fourteen of us and we would wind up playing on Saturday evenings at Gary Con for that year and three more in a row. Since we had fourteen, if we lost one or two each year due to scheduling conflicts and the like, we'd do what we could to fill out our ranks to the requisite number. When we all met to play, Tavis gave us some ground rules for making the characters. As I recall, it was a straight 3d6 in order and I wound up with a decent Charisma, a pretty good Dexterity, and a slightly better Intelligence. Other stats were average with Strength just below. Rather than go with a Magic-User, I went with one of Tavis's inclusions to (O)D&D, the "Expert Burglar." In the spirit of Old School punnery, I named him Tiptoe Tagends. Since we were starting off at 5th-level, he allowed for us to name several magic items, even if they were our own inventions. Tavis had veto power over our desires, of course, but the more creative we were, the more likely he was to allow it. With my intention to never draw blood, nor kill anything we encountered, due to the way I tend to play Hobbits, my creativity ran along those lines. I came up with three non-standard items, the first being the Non-cha-Lance. This was a six-foot long spear that would do no damage but rather stretch around behind an opponent and tap him on the shoulder, confusing him for a few rounds while he tried to discover who wanted his attention. The second was the Cloak-o-Smoke which could be used three times per day to billow a 20' radius of obscuring clouds. The third was a Pouch of Endless Coppers. One could reach into the pouch as often as one wished and retrieve 2d4 copper pieces but always had to put one back or the pouch would be useless until the following day. We also had to devise a downside or flaw for our character and I came up with something that plagued our whole group from time to time. Tiptoe was Cursed to always be perceived as if he were part of a group of fourteen. Anyone counting a group of which he was a member would count Tiptoe last and always come up with the result of thirteen plus one. If Mister Tagends was trying to get a room with even just one other fellow, he had to pay for an extra dozen. If he was traveling with an army of thousands, the enemy would never realize that hordes were on their front lawn. Even an allied General would wonder where all of his troops had gone during roll call. I made sure to play up the good and the bad of all of those choices and it got me in a lot of trouble in-game, though the other players very much enjoyed seeing the problems arise for me, often seeing them coming when I did not. I made sure to be wily and sneaky but goodhearted as a Hobbit often is. I even converted to the religion of a Paladin character, the Winged Sun, when I was raised from the dead after a particularly bad night of saving throw rolls. It was always a treat. The campaign being run utilized the classic Jennell (formerly Paul) Jaquays work "Night of the Walking Wet" (NotWW). Although best known for the Dungeons & Dragons modules "Dark Tower" and "Caverns of Thracia" put out by Judges Guild, NotWW has seen a resurgence in popularity in the last decade with the revival of Old School sensibilities. There's an excellent two-part interview with the D&D Legend on Grognardia here and here that ran a few months after our first foray into NotWW. Sadly, the campaign halted after four years running at successive Gary Con conventions. The schedule and timing for Tavis to return to Lake Geneva, WI, has simply not worked out in more recent years. For the last two, I have run a 1E AD&D for those of us who haven't slipped off to other games and we've had a very good time, but I know we all wish the group had been able to stay more intact with Tavis at the helm for as many Gary Cons as there will ever be. Such is the way of convention gaming; things change and we find other ways to throw our dice. On a side note, William Smith has taken up the D&D Thirty-Day Challenge over on his Six of Swords blog here.